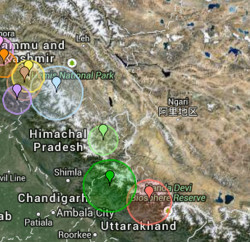 A mild intensity earthquake, measuring 4.7 on the Richter scale, jolted few parts of the state today. The tremors was felt in Kangra, Una, Bilaspur, Hamirpur and Mandi in Himachal and neighbouring state of Punjab at 3:43 PM and lasted for four to five seconds. The epicentre of the earthquake was at 31.4 degrees north and 76.1 degrees east in Hoshiarpur, falling on Punjab-HP border at a depth of 10 kilometres. No loss of life or property has been reported from any part of the state yet.